In times of low, there is always retail therapy to turn to. 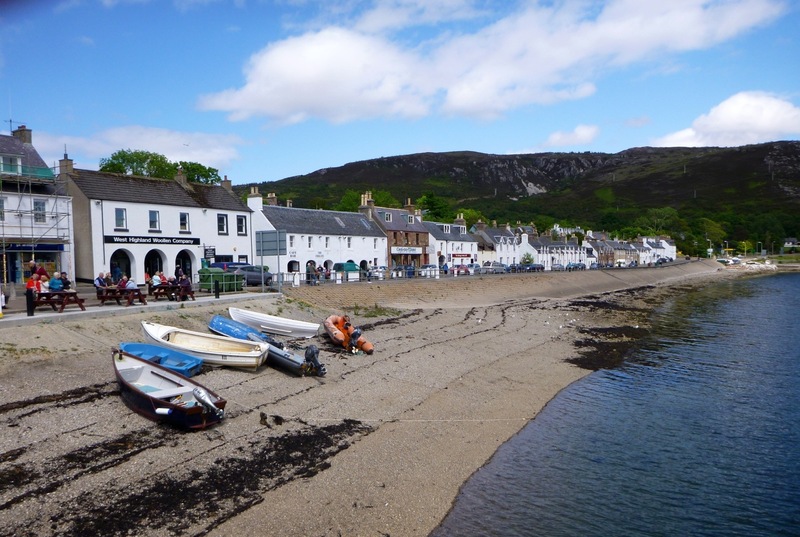 And so to improve our mood we hitchhiked to Ullapool on Thursday morning. We had nice coffee and bought lots of yummy food to bring back on school bus. It was a very interesting experience, which made me realised that no, I don’t miss my work just yet. Comfort buying is what distinguishes retail therapy from ordinary shopping, and so I have one of my comfort buys to share with you. 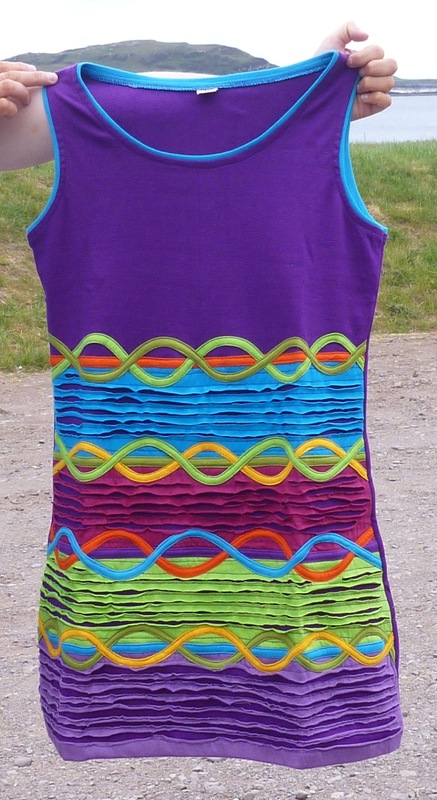 Pretty, only how would it fit into my already full dry bags and where am I going to wear it? But retail therapy works only for short while, so the day then resulted in the two articles, Czech and English. And none of us had good night sleep. Friday was much better. 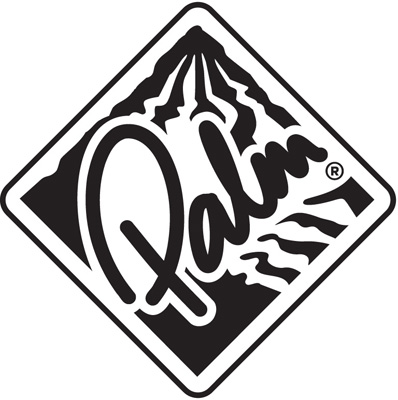 Many of you sent us messages via blog, face book, phone or email. We are very thankful for them. It wasn’t easy to keep distance and perspective on the whole think but we think we got there now. Yes it was just small group of people who got maybe jealous or maybe just misunderstood our concept. There was a prominent voice of the one kayaker, and he still continued in sending us message in similar tone yesterday, but we do laugh at it now. We are also overwhelmed by the support we received. We knew that our friends were reading our blog (compulsory) and then few other people did, too (fantastic), but so many? To see all this support really motivates us to continue with this journey, and hopefully it won’t scare us and change our perception and writing. So while we were still a bit low yesterday we went for walk. 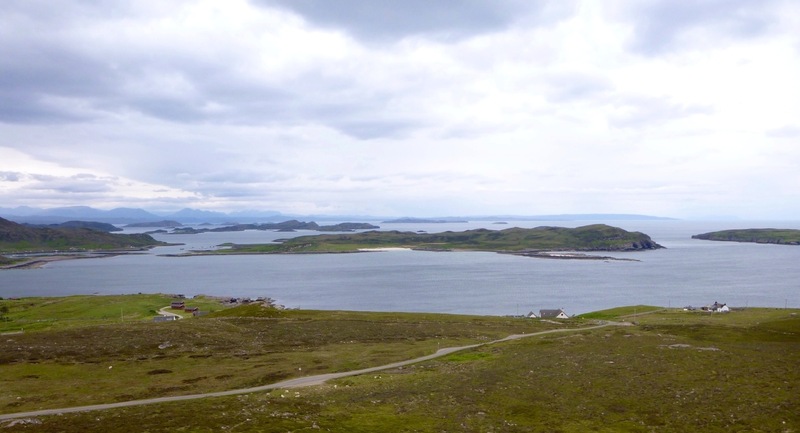 In the end we are in a very beautiful place of Summer Isles. 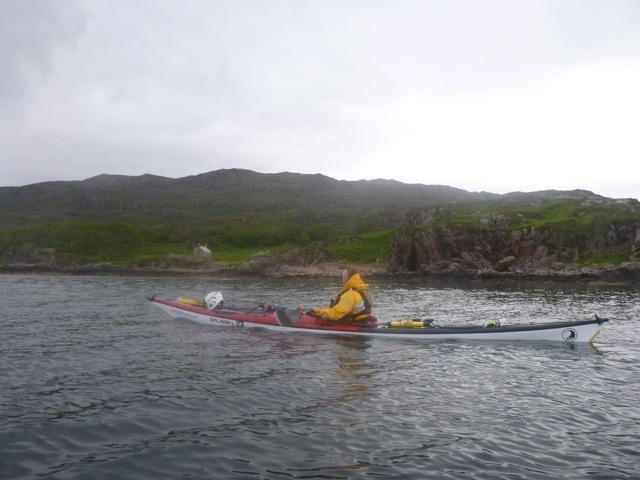 We admired them already during our arrival on Wednesday and took time to paddle past and around few of them. The first island we passed was Priest Island. 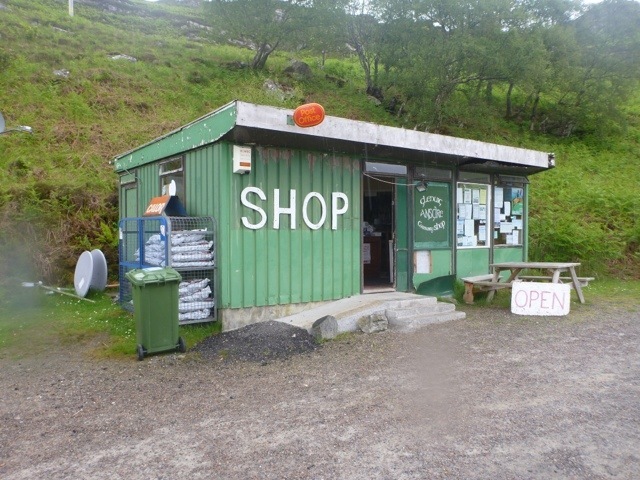 We had lunch there, but psst, don’t tell the R.S.P.B.it use dot be a favourite hunt for smugglers. The name of the island is apparently due to a priest using it as his retreat. 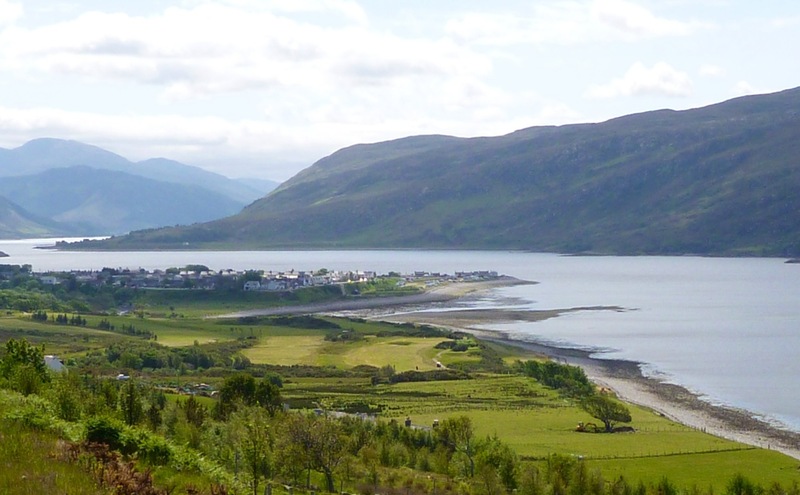 Another story talks about Lochbroom priest who used it and isolated punishment island for licentious monks during medieval times. Also an sheep-stealing outlaw was banished here by people from Coigach, but later was accepted back to the mainland society. It is named after Angus Kerr from Coigach,who having dishonoured the daughter of a respected local family, was apprehended and left to perks on this small rock. People regularly came to check on him. 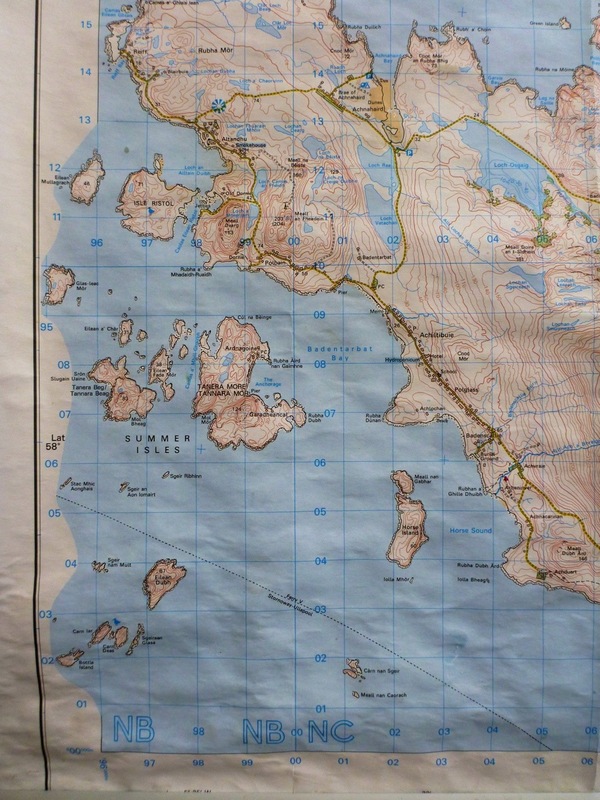 Once, although they removed the pears from their boat, Kerr managed to slip unnoticed, took the boat and drifted to the mainland near Stoer Head. Here he proclaimed himself as progenitor of the Kerrs of Assynt. 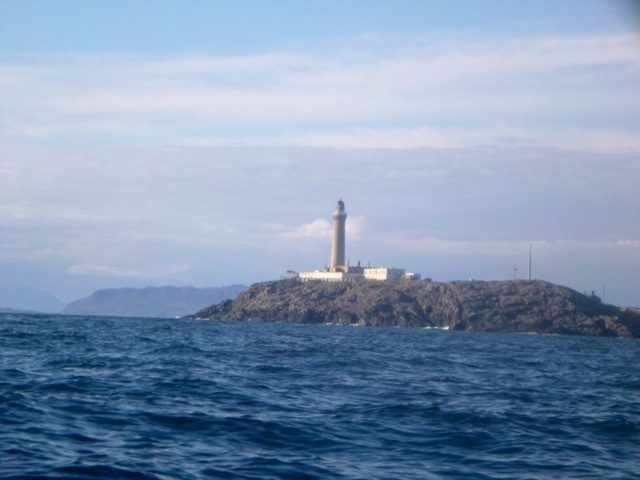 Is the largest of Summer Isles. It’s history stretches 1000 years into the Vikings times and was known as “Hawraray” – the island of haven, and used as their hiding place and base for mainland raids. There is also a tale of a legendary treasure still buried here waiting to be discovered by a “one-eyed” Macleod. In 18 and 19th century Tanera was widely populated, but by the beginning of the 20th century only two families remained. Today there is a cafe, holiday homes and a post office. Our campsite has a view of Risol Island. It used to have a fishing and curing station and inn for seamen. 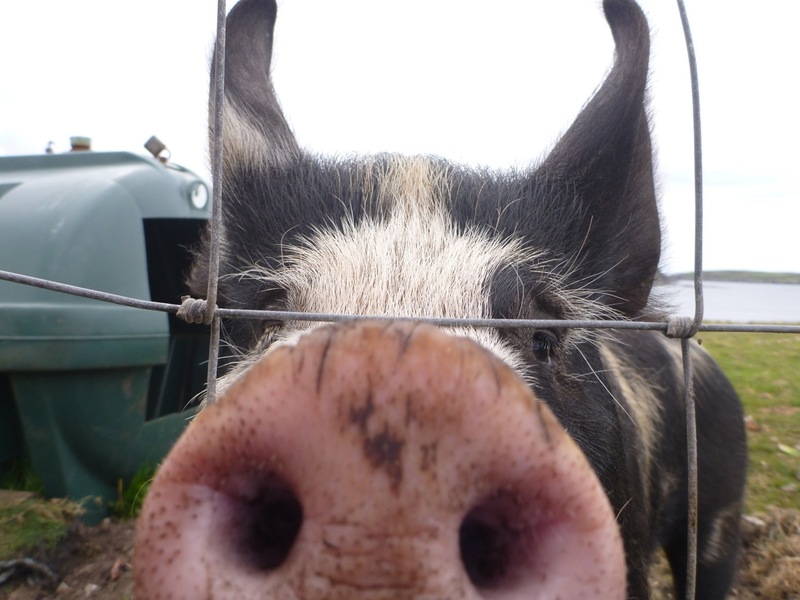 Also we befriended local pig. And since the weather wasn’t suitable for paddling, we at least tried some flying instead. We hope to be backbone water on Sunday and finally making some progress towards the north. North easterly F4 to 5(headwind), northerly swell, sunshine. And so, we didn’t get far. 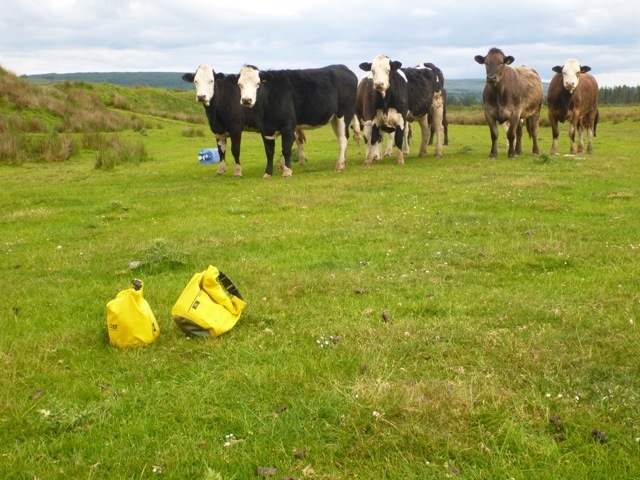 We heard about them, but as their location not usually publicised we didn’t know where to look for them. 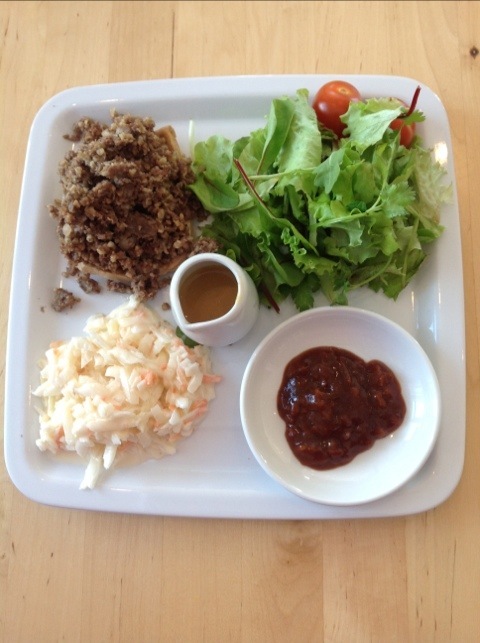 We just hoped that on our way around Scotland, we will come across at least one. Thanks to Johnny and Bruce we discovered two. 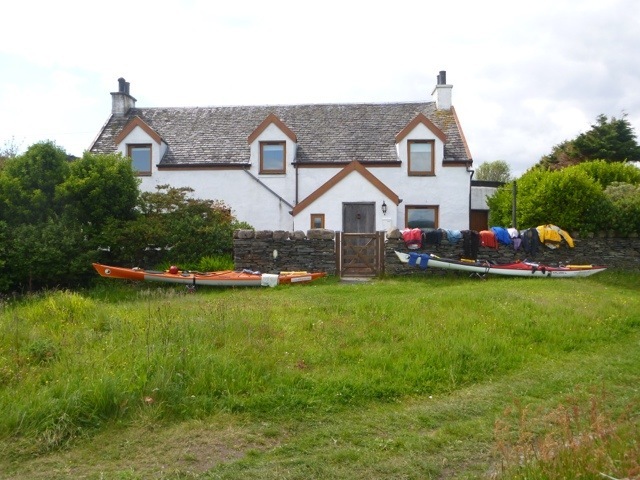 The first one we visited yesterday morning,where we not only met with B & J again, but also with Alison from seakayaking Plockton and two of her clients. Actually we met Alison earlier that morning while camping on a beach close to her house. She was very sorry she missed us last night and couldn’t invite us to stay in her house. But we are always happy to come next time. B & J shared the location of the next bothy and we parted our ways only to be reunited at Applecross Inn. We aimed much further than the bothy place, but yet again, our companion North Easterly made us to adjust the goal. 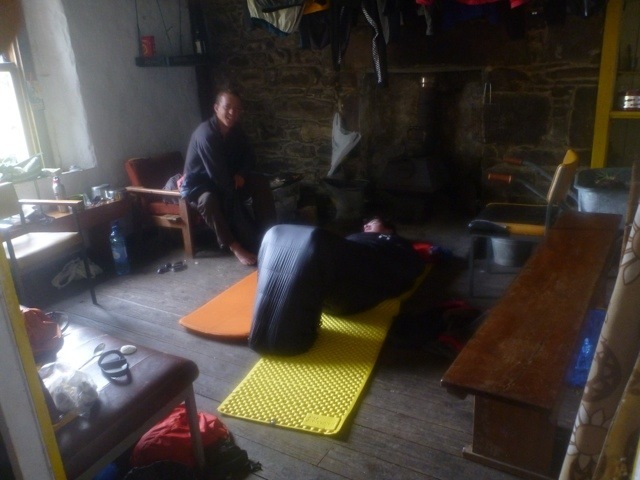 And so we had first experience of a bothy. Great! 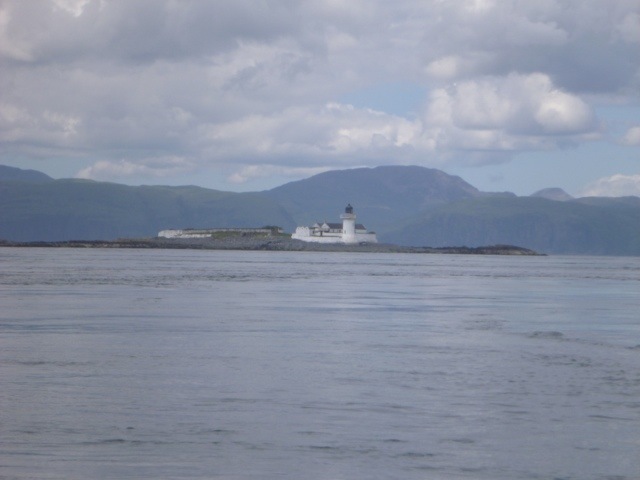 Today we set off with another ambitious plan, and felt sorry we wouldn’t be able to stay at Rhuba Reidh Lighthouse, about which we found on Joe’s blog, as we were to pass it around lunchtime. We listened to forecast at 1pm which predicted NE F4 to 5 for the next 2 days, we had F3, so thought nothing of it. The forecast was right, soon the wind picked up and the sea changed to predicted moderate. 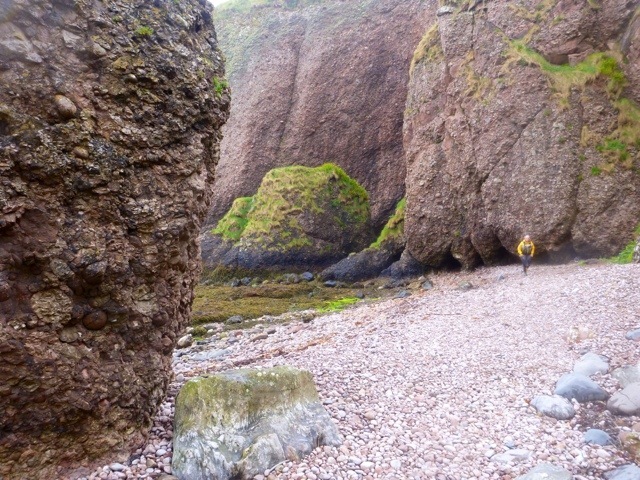 We were passing incredible cliffs and headlands with lost of caves, arches and other formations. 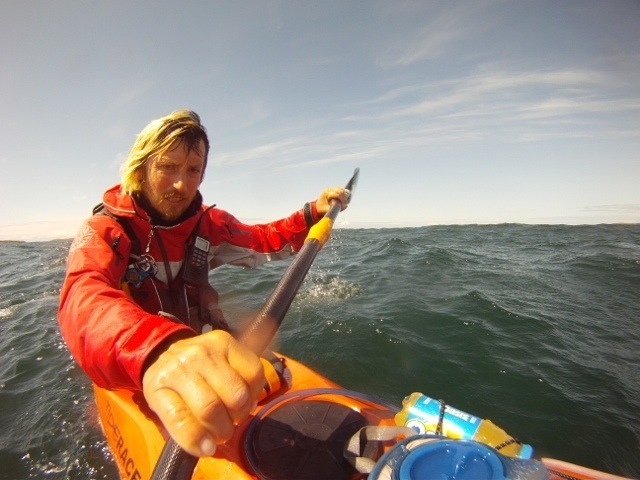 Unfortunately we could not go closer or enjoy it longer as the wind was getting stronger and waves bigger, close to solid F6. We have climbed over many moving hills when the lighthouse came into view. 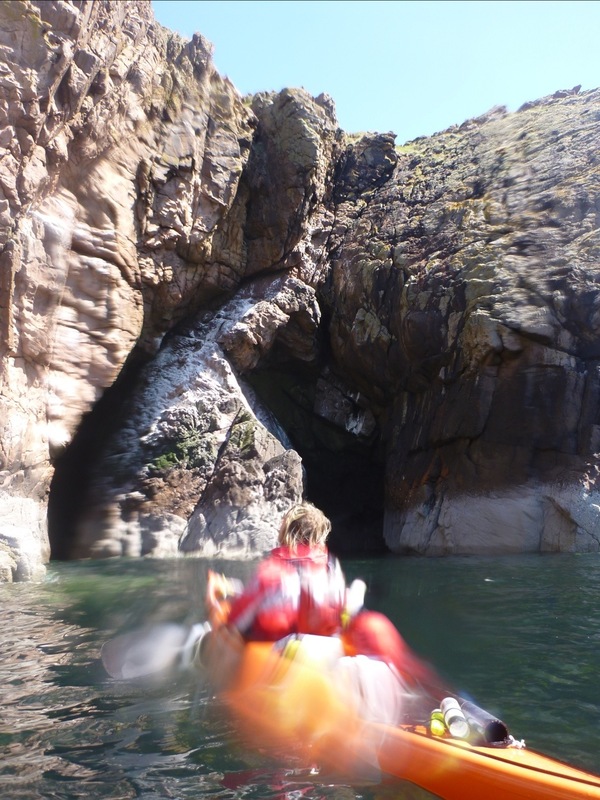 We attempted to pass it to reach the slipway, but the waves were getting even bigger and sharper and hitting directly the north side of the headland where the slipway is. We didn’t like at all and decided to turn back and land on yet another big boulders beach on lest exposed west side of the lighthouse. We coming back with such a huge following sea was very exciting but fortunately uneventful. The boulders were so huge that it needed some quick thinking action. I saw people watching us paddling, so went up to the lighthouse to look for help. After politely answering the question about where our car was ( sorry, Garry) two guys came to give us a hand. They were brilliant and the boats were on shore in no time. They saved us at least an hour of struggle and emotions. Thank you Garry and Alex. Seventy days on and …..
Today it’s been seventy days since we left London. Today wasn’t easy. We overslept, then Michal opened the wrong packet and instead of soup ( yes, we know, but we like it), cooked a sauce which is normally used with meat. So breakfast was a disaster. We had to get boats on the water over some bigger boulders. My knees chose to hurt with every step this morning and the boats were so heavy, that I struggled to lift them. In the end we managed to set of only for the headwind to start after first stroke. It was getting emotional. Michal wisely decided to stop for lunch before trying to get to the next headland, which may have been anything between one hour and three. While we were having lunch we saw some kayakers. They fast approached and landed. Each of them pulled their boat up easily. Some local youngsters, we thought. Then we started to chat. 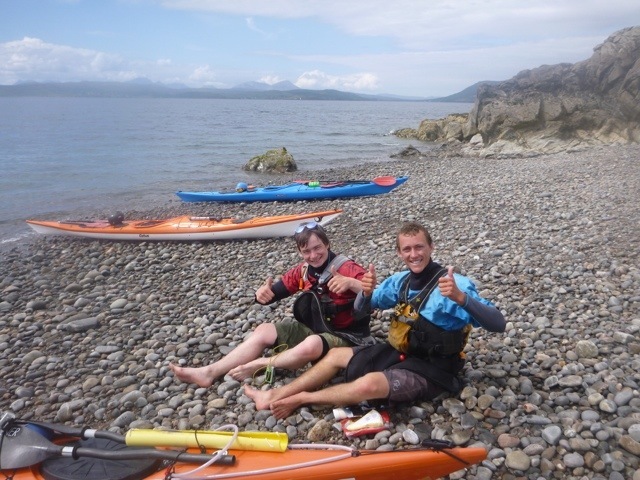 They, Johnny and Bruce, were part of the group of students from St Andrew´s who are circumnavigating Scotland in stages, with Johnny doing the whole circle. 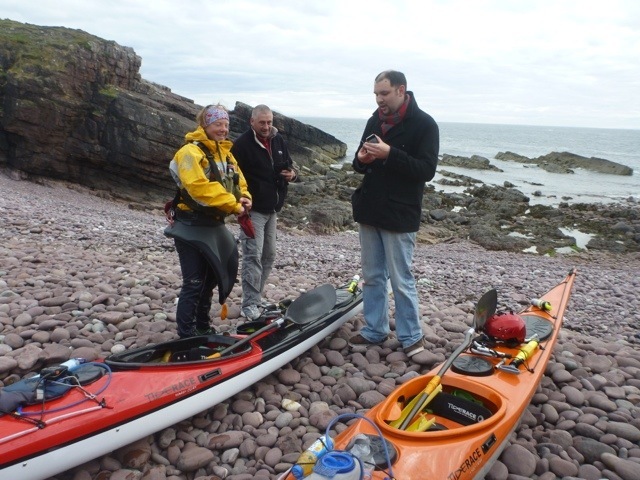 Their energy and enthusiasm rubbed on us a bit and we left feeling refreshed, even thinking that we may reach Applecross in the end ( we’ve been trying since yesterday). The positive feeling lasted only a little bit, although we left them at the beginning of their lunch, in an hour they overtook us. The day just got back to being, well, hard. We made it through Kyle Rhea, and our hope that we would had enough time to reach the bridge before the tide turns grew. Not for long. 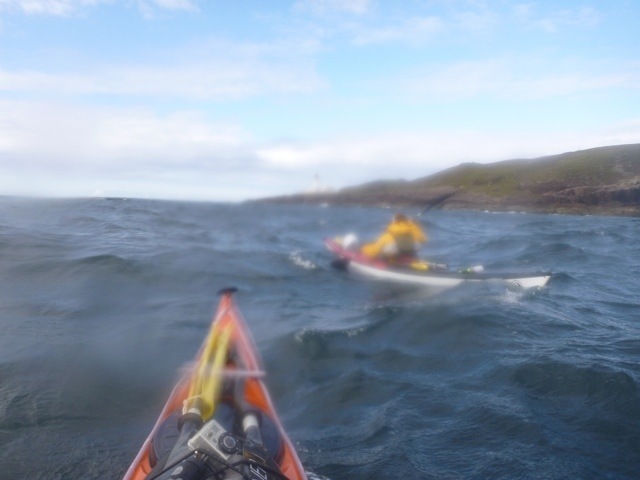 As soon as we entered the Loch Alsh the headwind joined in at solid F5. Only the sight of the Skye bridge made us to push. And just as we made it under the bridge, the tide turned. 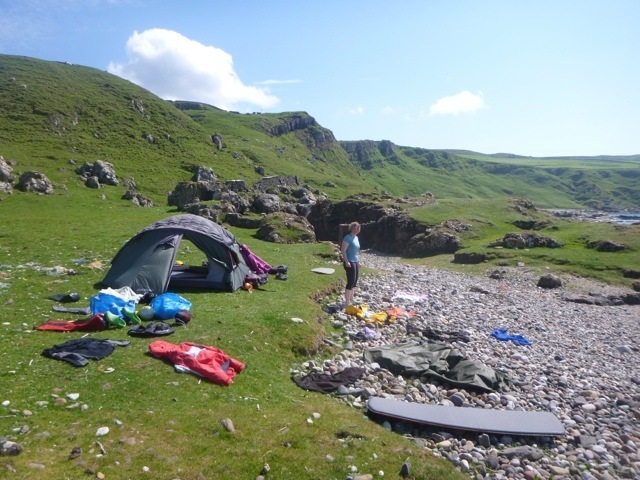 We decided not to cross towards Applecross in the headwind and spent an hour looking for place to camp. We found it in the end. 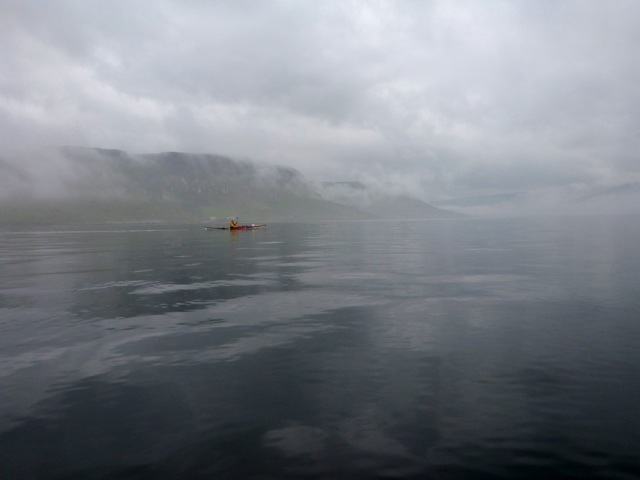 Calm and no wind, bliss? No, just lots of midges. What else to say, today was a hard work. 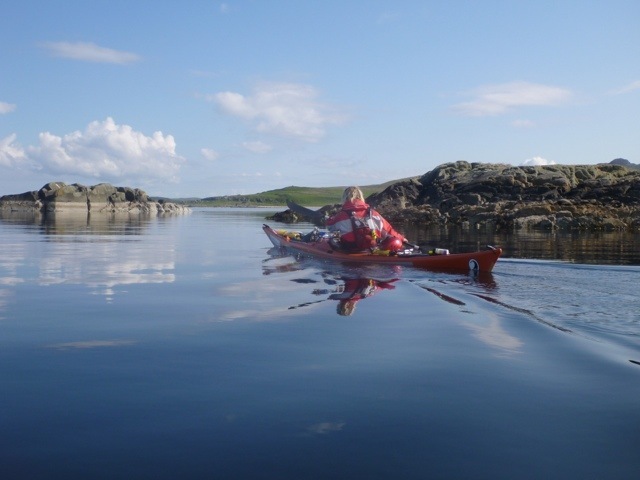 As some of you who follow our progress closely may notice our paddling speed lately varied although we have had good conditions. There are various reasons for it. 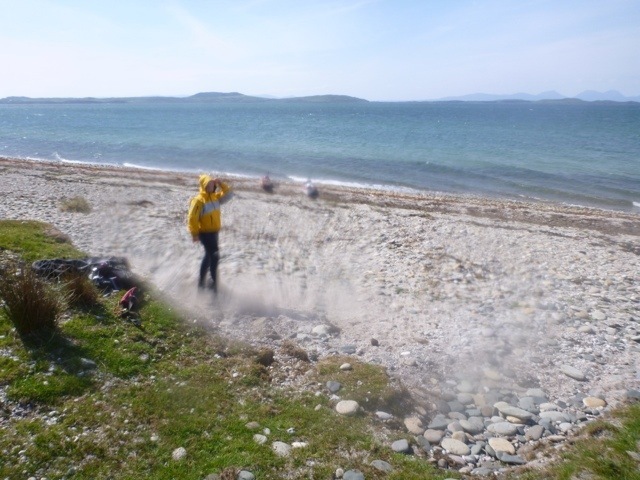 Firstly we were following tides in sounds between islands, also there were places where we had to stop. Sometimes it’s impossible to deny an invitation. And most importantly we are getting ready for the north. 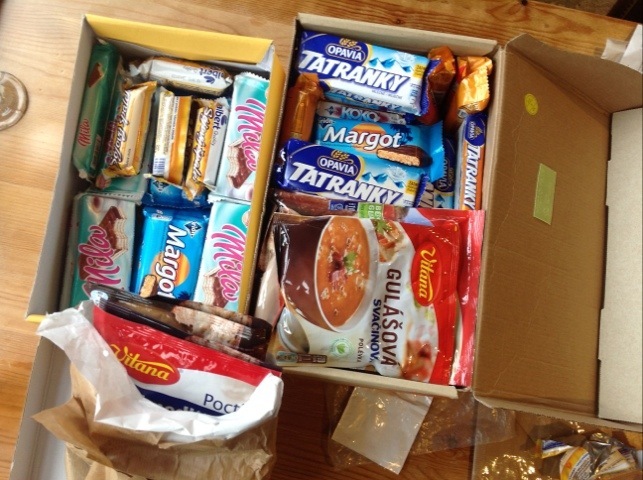 It looks like an important milestone so we want to be ready for it, physically, mentally and most importantly we had to collect treats sent by friends and family. So here we are at Glenuig Inn. 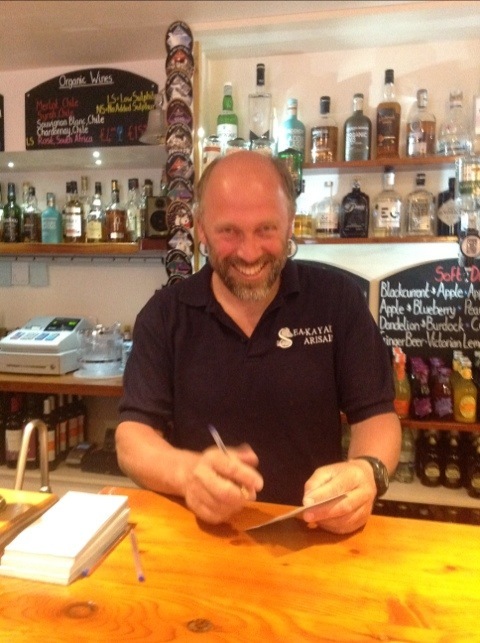 and Steve at Glenuig Inn who speaks fluent Slovak. Ever since we left London, I was going to Scotland. It seemed so far away and a long journey, then suddenly we are here !. The arrival was more sudden then what I would have liked. There was a feeling of satisfaction, we made it so far, and a little feeling of, yeah, we achieved, we are almost at our half point. This all made it hard to get motivated again. Why should we paddle any more and why so hard and where to? Yes, we know where we going, back to London, but this seems to be a very distant target. 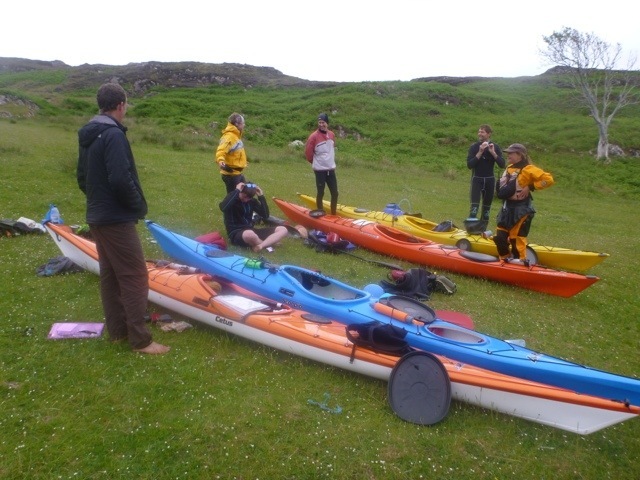 Fortunately, during this time of low spirits we received an email, it was from Cathy and Stuart, from Sea kayaking Oban. 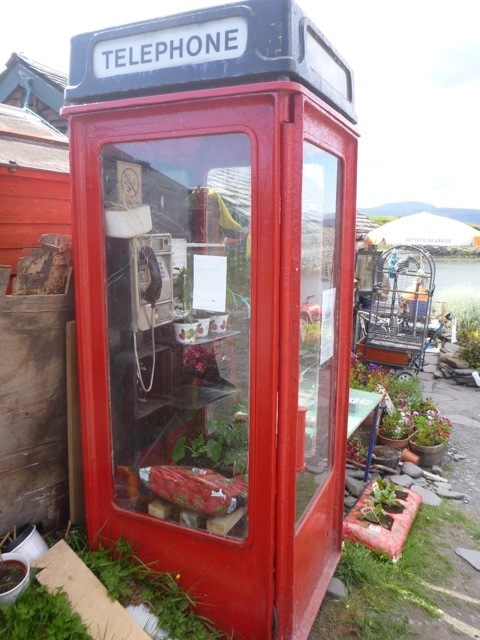 They were inviting us to stay with them on Easdale Island. 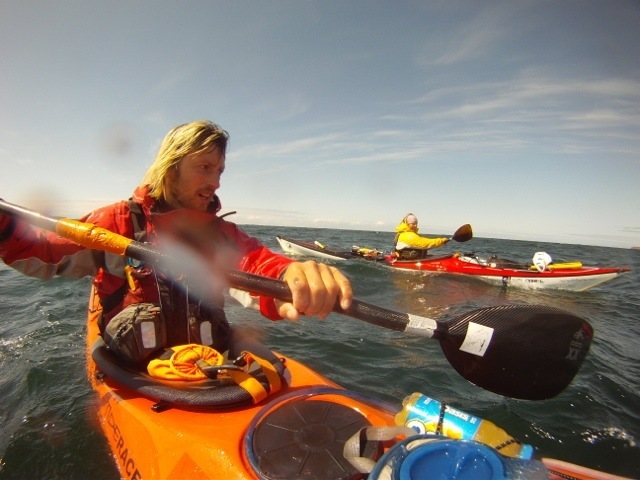 The new purpose for the following days paddling was given, and as always, once we had the idea where we were going, we wanted to be there as soon as possible. 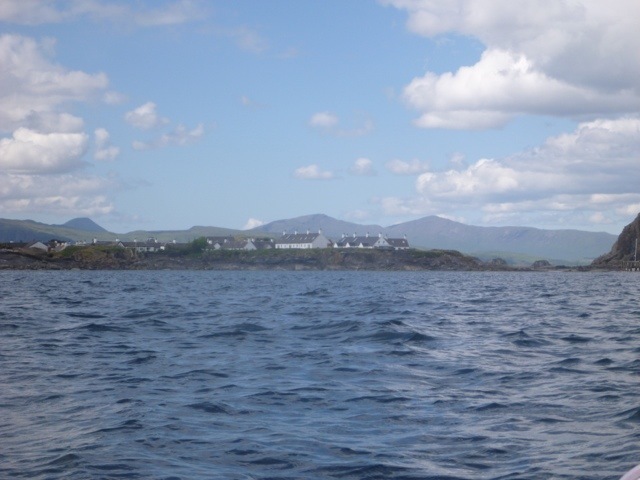 Easdale Island is north of Jura Sound, where tides move very fast as they have to squeeze in narrow gaps around Luing Island. Of course, if you need them, they have their own time table. From our pooh campsite it was about 80 km and with only six hours of tide in our favour, we knew it was going to take us more than one day. But the morning in the pooh campsite with the wind blowing against us and the troops of white horses on the water, it was clear, that we were going for a cake instead. However, wind eased a bit in the afternoon and we could get ready to leave at six. We played Martin Lee king and pushed against the tide and still noticeable wind till nine, when tide turned. 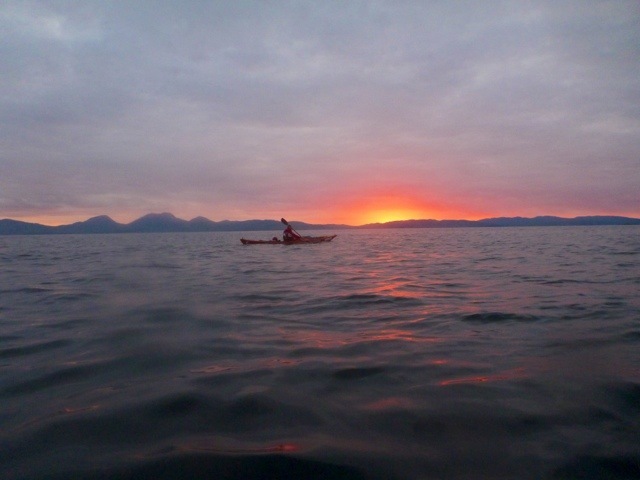 It turned into a calm evening paddle with a beautiful sunset over Jura. 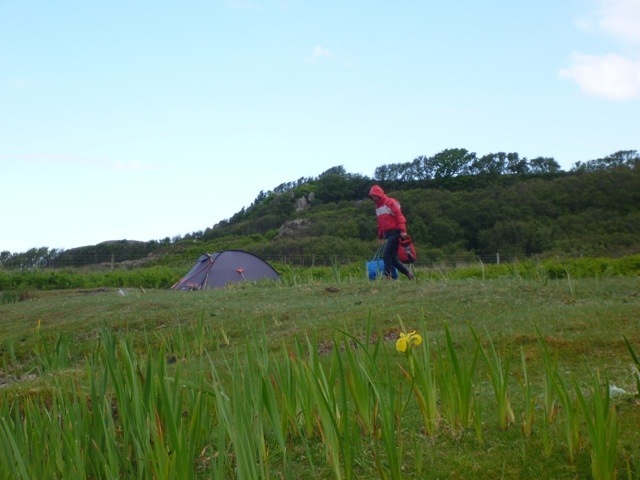 At eleven, when it got darker, we decided to look for a campsite. 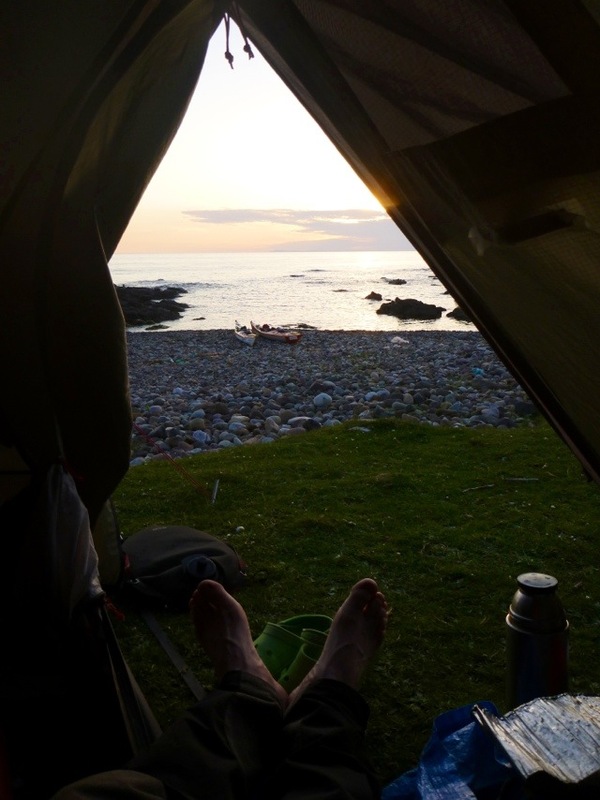 We found a secluded beach somewhere around Point of Knap, and on it was a tent with someone who turned out to be a great snorer. But still we felt sorry for him, since he had to walk for miles to get to such place and still had the party gate crashed. One important thing, the MIGDES have officially found us. And having spent one morning packing with their help convinced us that that night we are going to sleep in a house! 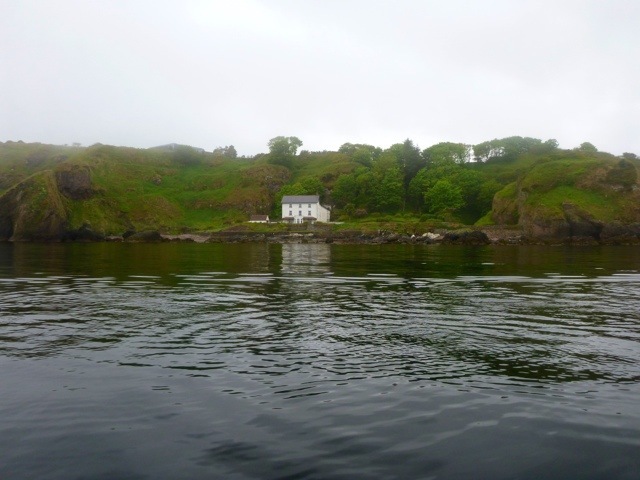 We left shortly before the tide turned in our favour and whizzed through the sounds worried, that by Luing the tide would turn against us and we will never make it to Easdale. Beautiful, everything around was beautiful, that we are missing the words to describe it. However there are many words to say about Coryvrecan Sound. 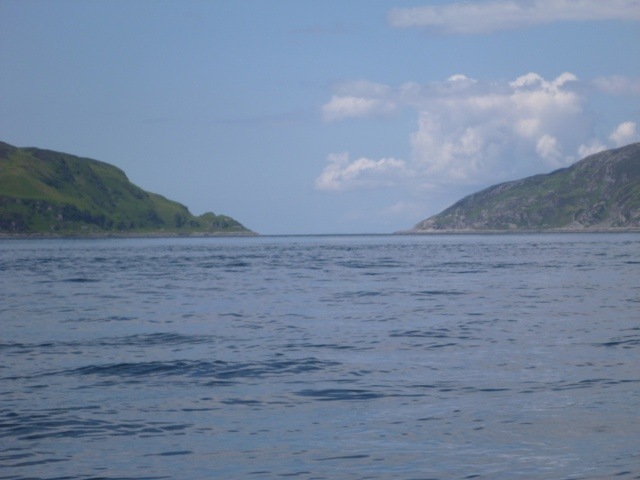 This is between Jura and Scarba, we had no intention of going anywhere near it, but still we could feel the pull from it. And to make it more eventful, the sun suddenly disappeared behind the clouds and the wind picked up. After passing an island opposite Coryvrecan Sound many confused streams and eddy lines were playing with our boats. 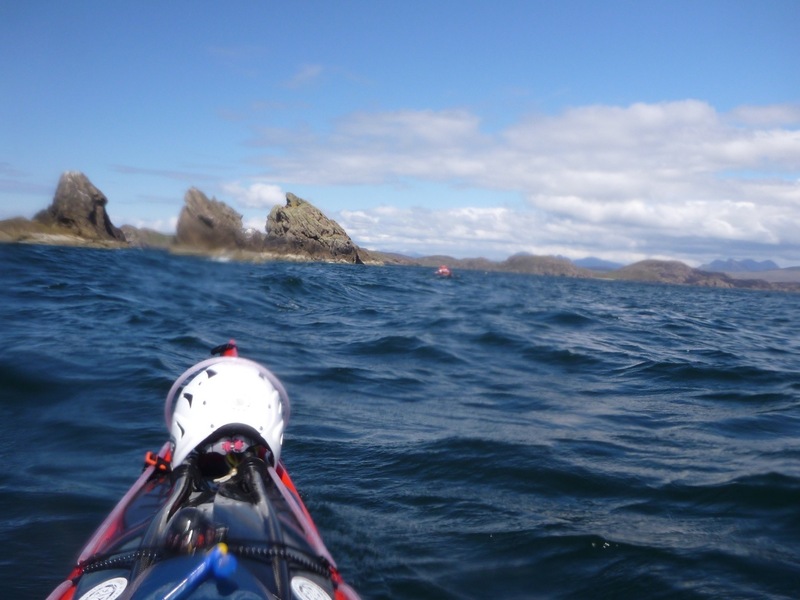 And when we stopped paddling we could hear the roar of the sea. In the end we passed the entrance all right, and more than being in actual danger, it was the reputation of the place which played with my imagination. Now with the time running tight we pushed harder and soon were north of Luing. The tide was fast but we could not keep our boats straight as again many eddy lines and confused streams were playing with them. 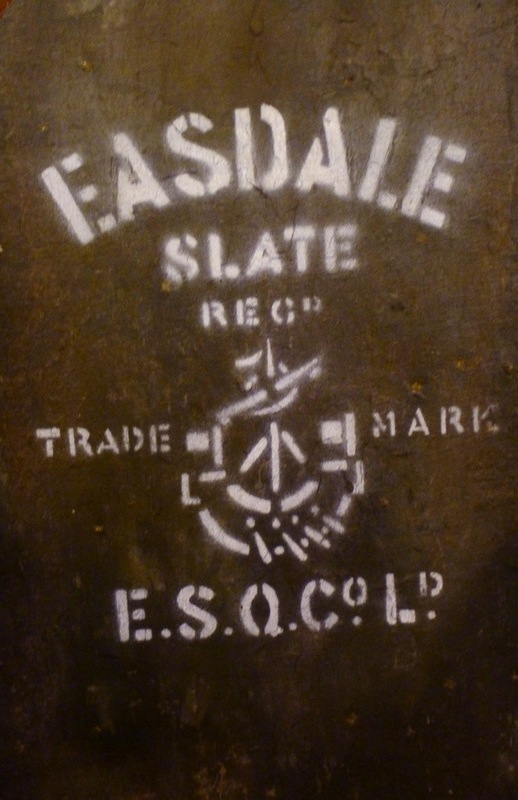 So we enjoyed skidding like cars on ice seeing that we were going more or less where we wanted to, towards Easdale. And once we passed the lighthouse on Fladda we relaxed knowing that we would make it there, and took time to admire the landscape around. We came earlier than expected, so we made ourselves at home waiting for Cathy and Stuart to return from work. We went to explore the island. 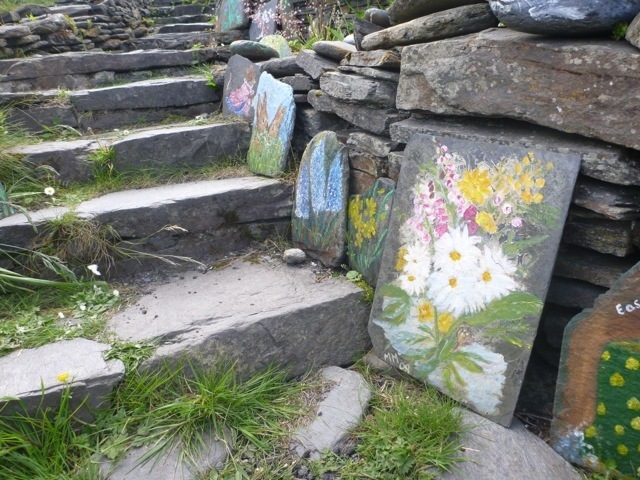 It was a thriving slate quarry in 19th century. And slate is lying everywhere around here. 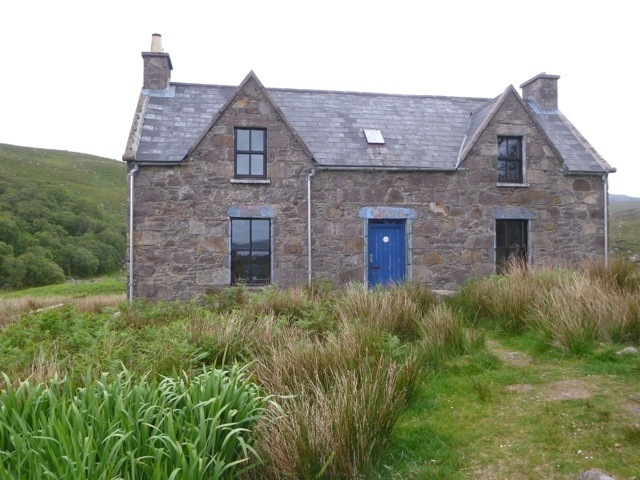 The island is very picturesque with restored former workers cottages. Some of them are holiday cottages but there are still about 50 adults and 20 children living here permanently. 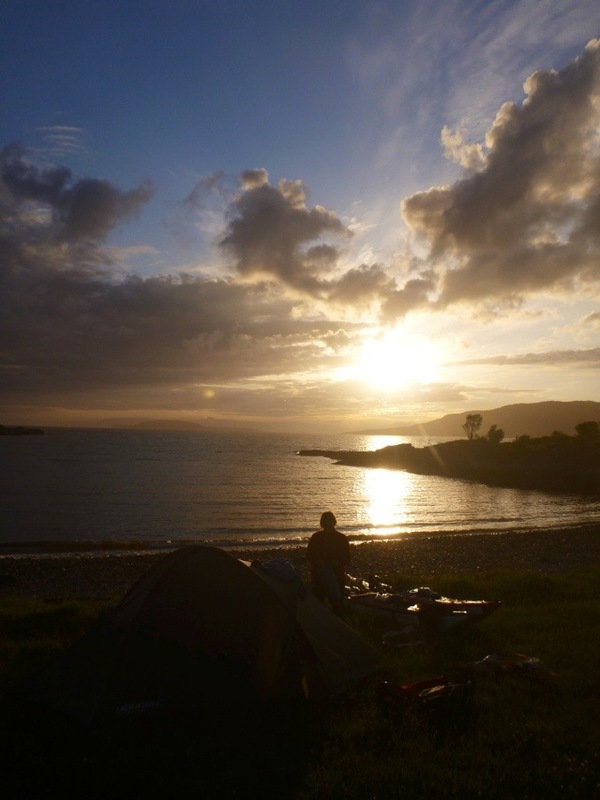 First evening in Scotland provided us with beautiful campsite and matching sunset. Morning followed suit with colourful sky. Only the sea was noisy with waves breaking over the stones indicating that weather is about to change. 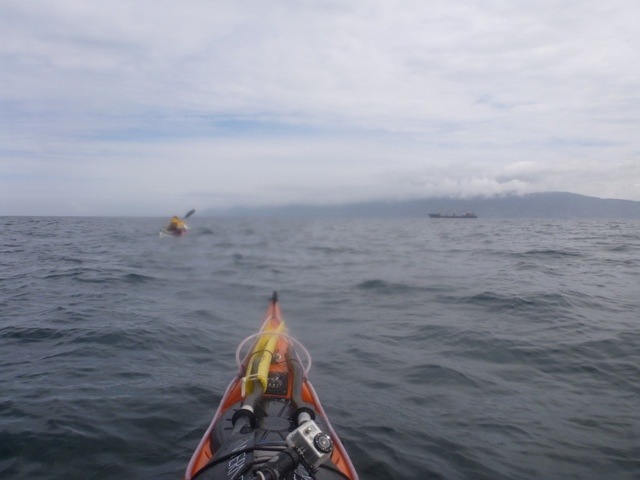 Today, as we passed first headland, the wind hit from the side. At first we didn’t worried much as it was blowing from the east and we were heading north. However as the day progressed the strength increased with hills and headlands changing its direction, by mid-afternoon we realised that we were not going anymore forward, but fighting not to go back. And so another romantic place it is, full of sheep and cow pooh. The wind is forecasted to increase to F6 during the night, but this place has a small ridge sheltering us from the worst. Tomorrow’s paddle is not clear yet. So we are back on the mainland. Yesterday we had a short day on the water. 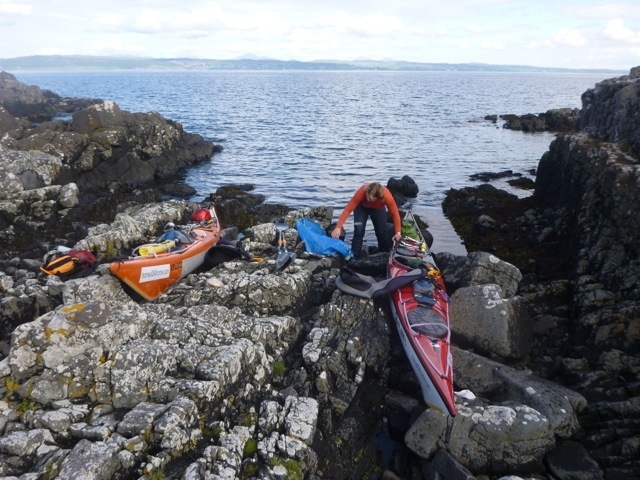 We paddled from Glenarm to Cushendun to reach the best place for crossing to Mull of Kintyre. Tides were running in our favour early in the morning or late in the afternoon, it was also quite foggy, so we could not consider crossing the same day although I could have been tempted otherwise. 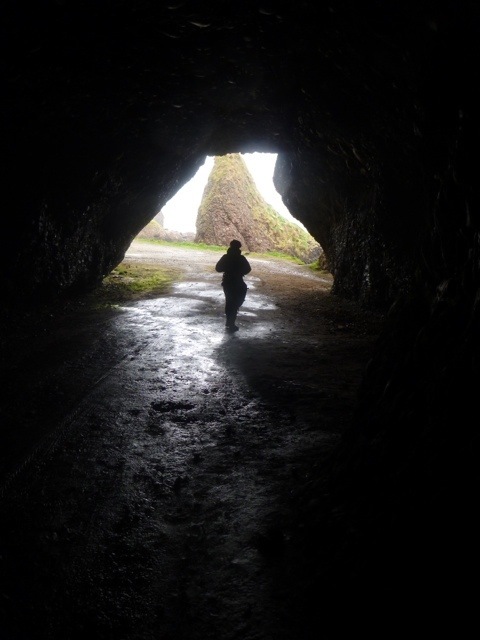 At Cushendun we have found an interesting house on a secluded beach having a system of caves as a driveway, it looked wicked. Today we left at half past seven towards Scotland. Crossing was OK, it was an important crossing, since it brought us back to mainland. It wasn’t as hard as we expected but it still felt longer than what it actually took us. There was an unusual number of Puffins flying around, more than we’ve ever seen on this trip before. We landed half past two, and I have to say, it is great to finish early sometimes, especially when it’s sunny. We managed to let all of our wet kit to have some sunbathing. 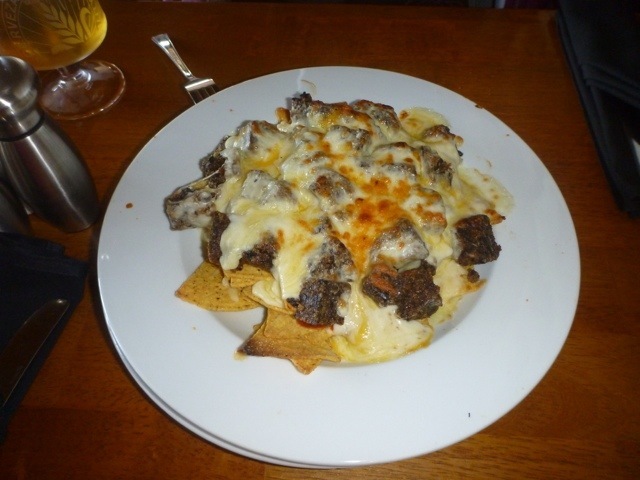 And as a treat we had Haggis Nachos, what a great first day in Scotland.